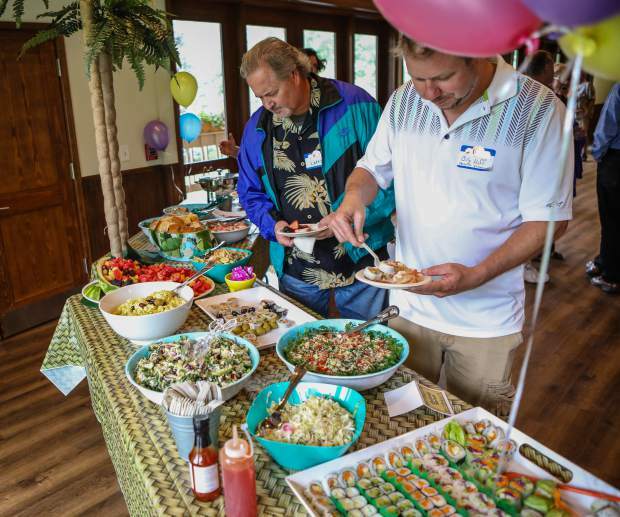 People make their way down one table of food, the seafood table, during SteamMasters' 40th anniversary celebration on Wednesday, Aug. 2, at the Eagle-Vail Pavilion in Eagle-Vail. EAGLE-VAIL — If you’ve been in business for 40 years, then you get to know some folks. And if you throw a 40th anniversary party, then it’s likely to be a big one. A 40th anniversary party for SteamMaster on Wednesday, Aug. 1, packed the Eagle-Vail Pavilion with friends, clients and colleagues who came out to celebrate with company founders Gary Gilman and Julie Stoxen. Cars were parked on the street outside the pavilion, and food and adult beverages were in abundance. New friends were made as people mingled and mixed. Local Realtor Larry Agneberg has been in business just about as long as Gilman and has known Gilman since 1978, the year SteamMaster was founded. The two have skied together often on what Agneberg called the “Pro Leisure Tour.” Gilman is a firm believer in playing as hard as he works. Like most of Gilman’s friends, Agneberg is also a SteamMaster client. “We use them all the time,” he said, for both conventional carpet cleaning and when fine rugs need work. Chip Bair, who was chatting with Agneberg, used to work for B&B Excavating. Years ago, there was a smell in the company’s Edwards office. “Gary sent a guy out who had the nose of a bloodhound,” Bair said. The guy in question found the smell — that’s the good news. The bad news is that the smell was coming from dead raccoons in the office. But SteamMaster found and cleaned out the stench. “You don’t last 40 years without having top-notch personnel,” Bair said. As the party proceeded, a number of friends came to the microphone to talk about Gilman and the company he and Stoxen started. Among those friends was Debbie Marquez, who watched Gilman start SteamMaster in the garage of the home in Vail’s Intermountain neighborhood that they shared in 1978. “I’m not sure if he even had a truck then,” Marquez said. “It’s been pretty special to see (Gilman’s) business grow,” Marquez added. Marquez, a co-founder of Fiesta’s Cafe and Cantina in Edwards, is now with American Plumbing, Heating and Solar in Eagle-Vail. She credited Gilman with convincing that company to participate in the valley’s Actively Green program. Moving on sustainability issues is a sign of Gilman and SteamMaster’s leadership in the valley, Marquez said. Walking Mountains Science Center founder Kim Langmaid also praised SteamMaster for its environmental leadership. Longtime resident Bob Moroney added that Gilman and Stoxen have always been leaders “in doing the right thing,” including building housing for company employees. And, from work to fun, everything has been done in Gilman’s distinctive style. Moroney recalled that when he and Gilman were working the local Rotary Club’s annual Labor Day rubber duck race in Vail, Gilman was driving while trying to talk simultaneously on two cellphones. The duck race, and the SteamMaster work, all got handled, and handled well. It’s that blending of fun and work that has helped keep SteamMaster rolling for 40 years. 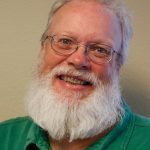 Friend and colleague Charlie Woodard, of St. Louis, noted that he came to know Gilman and Stoxen professionally, which led to off-hours adventures. Woodard called a dune buggy ride in Mexico with his Colorado friends one of the “scariest car rides” he’s ever had. Sometimes, friendships become professional connections. Mike Bettman met Gilman playing soccer in the Denver area. That led to helping Bettman get his own business off the ground. Not a lot of people give their heart and soul to helping others succeed, Bettman said. Helping the community has long been a big part of SteamMaster’s mission. Tsu Wolin-Brown, director of the Vail Valley Salvation Army, noted that SteamMaster cleaned the carpets of the organization’s Avon office, and Gilman and Stoxen provided a large freezer for the food bank. For the past few years, Gilman has served on the board of the Vail Symposium. Fellow board member Dale Moser said Gilman has been “extremely influential” in helping create the symposium’s programming in that time. As the room started to empty, Craig Armichaux, of Glenwood Springs, summed up the event and the past 40 years. “Anybody who can stay in business 40 years is really doing something right,” he said.